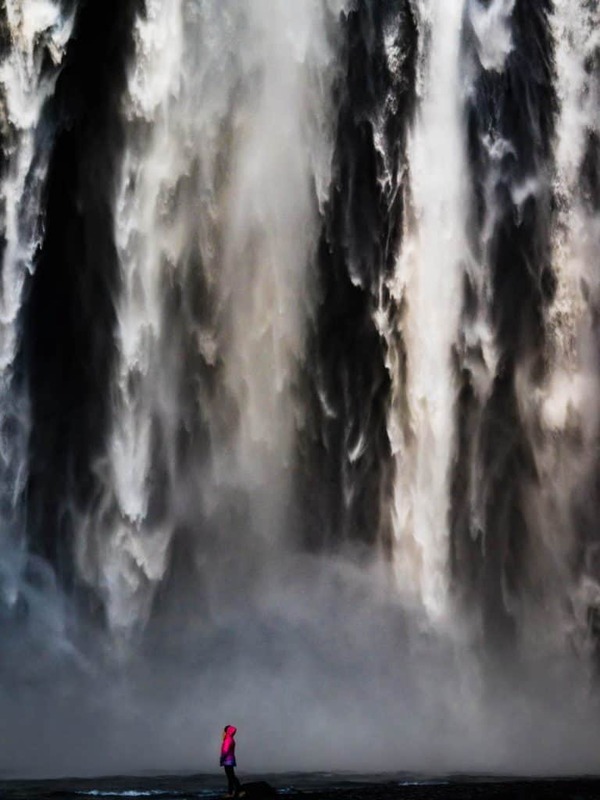 The best waterfalls in Iceland are the stuff of myths, legends, history, and folklore. The island nation is well known for its dramatic landscapes. 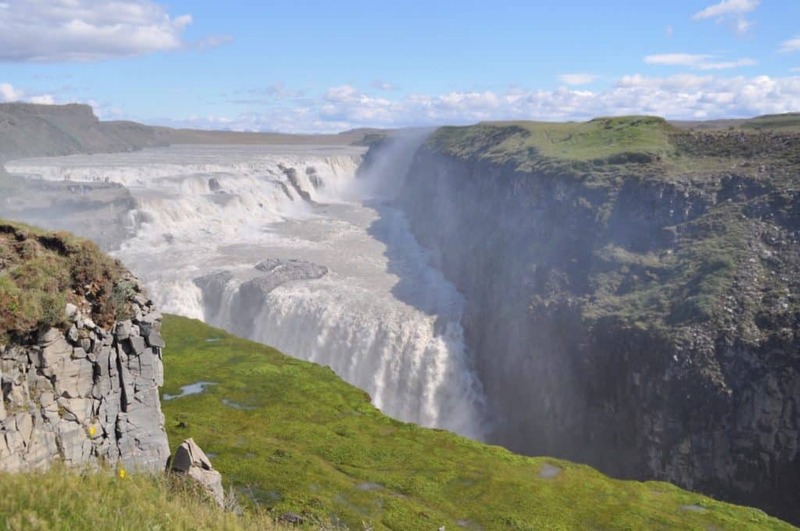 It is known as the land of fire & ice so naturally, there are a plethora of waterfalls. There are literally so many waterfalls in Iceland it’s nearly impossible to count them all. So how do you find the best Iceland waterfalls? In this post, we cover the best waterfalls in Iceland and where exactly to find them. I should also note that in Iceland nature is free, so you don’t have to pay anything to see these beautiful waterfalls up close! 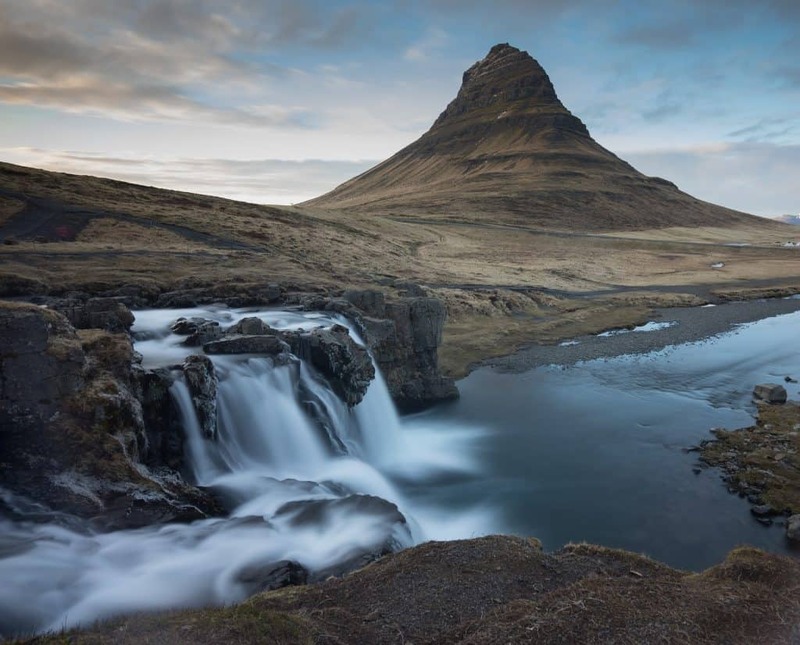 This waterfall may be the smallest on this list, but its location near the 463 meters high Mount Kirkjufell that sets it apart from the rest. It’s a hotspot for photographers as they can capture the waterfall with the iconic mountain in the background. Being on the Snæfellsnes peninsula so close to Reykjavik it’s also one of the most popular. Come here at sunset and you’ll be bumping shoulders with the outer tourists all vying to get their show. If you’re looking for the best time to visit in Iceland it would have to be summer as the midnight sun creates an amazingly long “golden hour.” To capture the best possible photo of both Mount Kirkjufell and Kirkjufellsfoss you’ll need a wide-angle lens. Hraunfossar literally translates to “Lava Waterfalls.” It’s hard to convey the beauty here as Hraunfossar is a combination of creeks and large and small cascades streaming out of the lava over a distance of about 900 meters. A series of cascading waterfalls are formed from the Hallmundarhraun lava field and pour into the river Hvíta. The result is peaceful and serene. If you have been to Plitvice Falls in Croatia you can see the similarities. These are some of our favorite waterfalls in Iceland and we were lucky enough to catch them as the birch trees turned orange. They are located near the small, but lovely town of Husafell. The surrounding area is one of the few areas in Iceland you can still experience a forest. When we visited there was a parking attendant trying to collect 1000 ISK for parking at these falls, many people drove around him and didn’t pay the fee as enjoying nature in Iceland is free. Gullfoss is the most popular waterfall in Iceland and it’s also one of the largest. 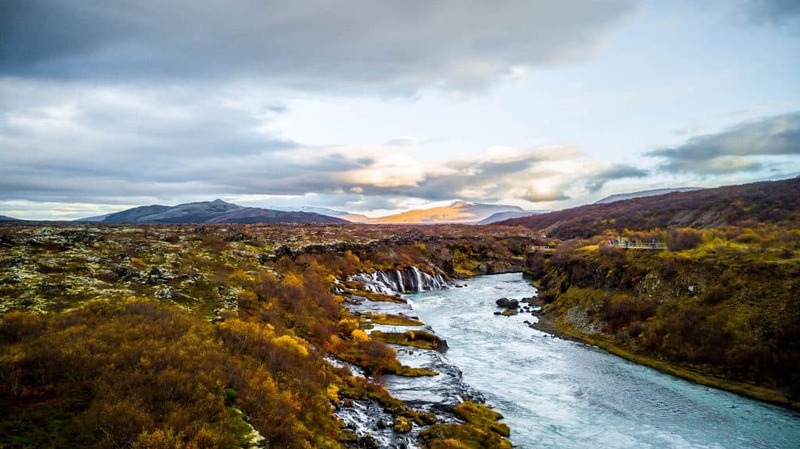 The waterfall is a stop on the Golden Circle route along with Geysir Hot Spring and Þingvellir National Park. It’s a mesmerizing sight to watch the Hvítá River drop down a deep ravine. Make sure to bring your favorite travel camera and a rain jacket as the waterfalls produce a thick mist and frequent rainbows. You can easily access the falls from a large parking lot with a pathway and steps that allow for visitors to walk along the edge of the mighty waterfall. There’s also a cafe, gift shop, and restroom nearby. Chances are you’ll be joined here with a few tour bus groups so try to avoid midday if you want to avoid the crowds. Seljalandsfoss is one of Iceland’s most famous waterfalls and for good reason. The massive 65-meter high waterfall gives you the chance to hike behind the falls for a unique perspective. You’ll want to bring rain gear if you decide to stand behind Seljalandsfoss, or you will get soaked. It’s also important to note that in the winter times the path behind the waterfall may close due to slippery and uneven surfaces. Seljalandsfoss is located just off the Ring Road on the South Coast before the town of Vik. 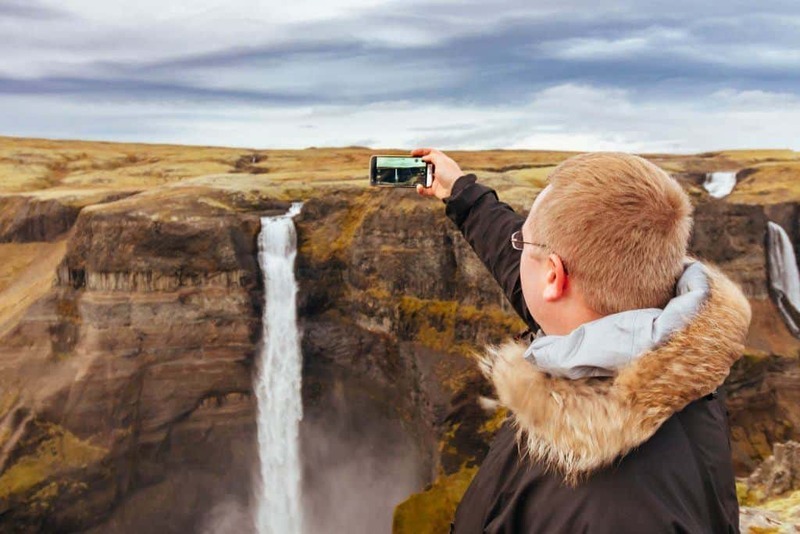 It’s a stopping point for just about every tour and can easily be combined with a visit to Skogafoss. If you could picture a waterfall in your head it would be Skógafoss. 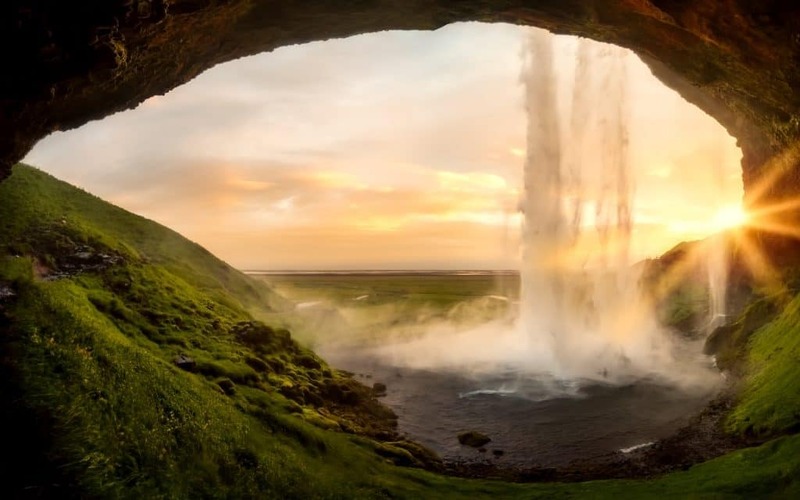 The classic shape of this Icelandic waterfall along with its convenient location and accessibility make this a waterfall a hit with everyone. Skógafoss is located right off the ring road eight before or after the town of Vik – depending on where you come from. It was easily one of our favorites and most photogenic waterfalls on our Ring Road trip around Iceland. If you want to feel humbled just stand near the base of the waterfall. What truly made the falls unforgettable for us is the ability to stand meters away from the misty base of the waterfall. There’s also a long staircase to the top of Skógafoss giving the most amazing views. Dettifoss is said to be the most powerful waterfall in Europe. 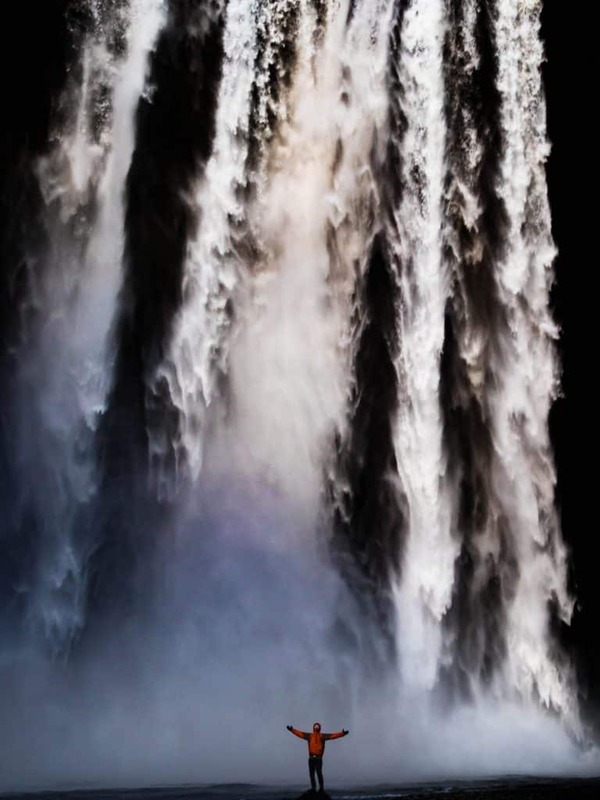 The waterfall is monstrous and one of the most impressive natural landscapes in Iceland. You can hike right up to either side of the waterfall and you’ll feel the ground tremble beneath your feet. Its remote location in the North of Iceland makes for far fewer visitors than waterfalls on the South Coast of Iceland. The waterfall was most notably featured in the opening scene of Prometheus, check out the epic visuals from Ridley Scott’s opening. Goðafoss is well worth a stop on any Route 1 journey. There’s a parking area nearby and from there you can easily walk around the falls. We got lucky and saw kayakers braving it down the massive fall while we were there! There’s a rest stop nearby, but not much else so come prepared with food if you want to have lunch at the Waterfall of the Gods. You might come to realize that names in Iceland are quite literal. Brúarfoss means “Bridge Fall,” due to the fact at one point a natural stone bridge had formed over the narrow gorge formed by the waterfall. The glacial waters here are a deep blue and the waterfall is prized for its beauty. 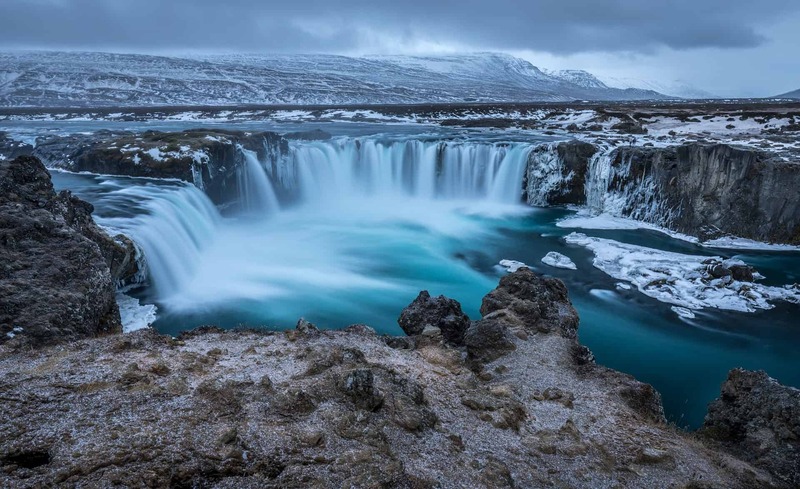 Locals have even declared it “Iceland’s bluest waterfall,” which is saying something! Bruarafoss is not as well known as some of the other waterfalls on this list as it’s not easily accessible from the main road. 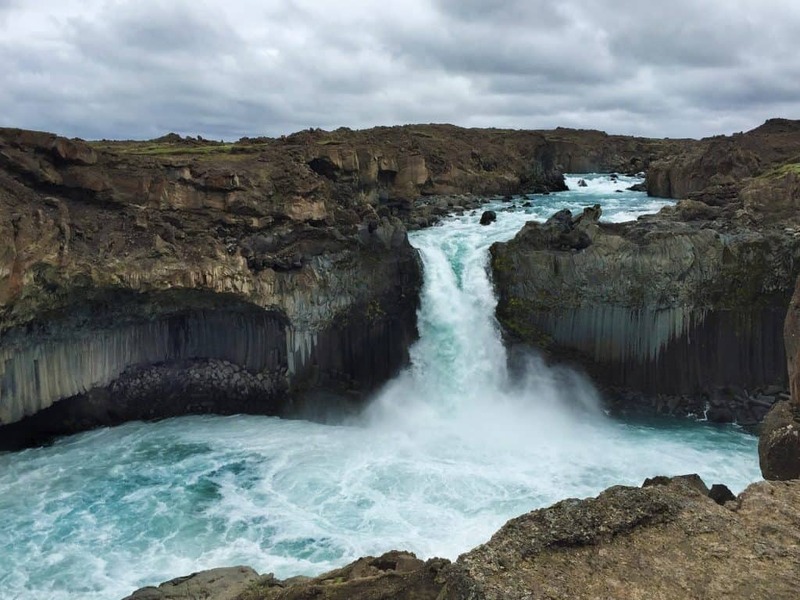 It’s located in the west of Iceland and is less than an hour and a half from Reykjavik, so if you’re up for an adventure and checking out a place many others don’t know about head here! Svartifoss is one of the most iconic waterfalls in Iceland as it is surrounded by basalt columns. The waterfall is located in Vatnajökull National Park, the largest national park in Europe. To reach the park you must hike around 30 minutes from the Skaftafell Visitor Center. It’s roughly 1.5km with a slight incline so just about anyone should be able to make the hike that passes two other waterfalls along the way. The hike is well worth the views as you can see from the photo! Háifoss is the fourth highest waterfall in Iceland. It’s a really impressive sight as the water rolls off the 122-meter sheer cliff to the Fossa River below. If you look in the photo above you’ll see the waterfall “Granni” to the right of Háifoss. I don’t want to show you the whole thing so you can be surprised when you get there. If you suffer from vertigo you won’t want to get too close to the edge here – it’s a long way down. It is possible to hike down if you know the way. While we were visiting nearby Landmannalauger we convinced our guide to take us to Háifoss to grab some photos. I’m happy he did because our Happy Camper would not have done well on the worn road there. The road up to the waterfall is rough for low clearance vehicles. While it is nothing compared to the roads we’ve seen in Africa we did see a stranded couple after busting their cars oil pan. So I would ensure a proper 4×4 or high clearance vehicle to make the trek to Háifoss. This is the second waterfall in a stunning series of waterfalls on the Skjálfandafljót river. 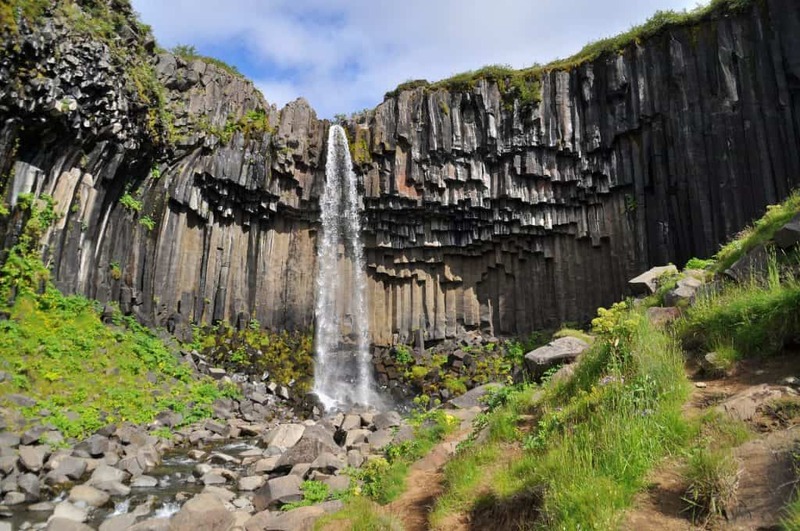 It’s similar to Svartifoss as you’ll find more dark-colored basalt columns. The black basalt columns mixed with the white waters of the fall create a beautiful scene. It all adds to the allure and rugged beauty that Iceland contains. The waterfall is accessible on a two-hour detour from Goðafoss and requires a 4×4 to access it. Due to its inaccessibility, you could show up and be completely alone! A campervan is the best way to get around Iceland on a budget. While a camper is slightly more expensive than a car, you can sleep and cook in it! Meaning you don’t have to search for any hotels or deal with expensive restaurants in Iceland. Plus you get to sleep in nature every night and still use a heater if you wish! If you want to travel with a Happy Campers van as we did (and you should they are the BEST!) make sure to read our full review. You can easily book using this link, but make sure to book well in advance during high season. However, my personal favorite time to travel Iceland is during the fall months. It’s during September and October where you will see the leaves change vibrant colors around the country. Temperatures are still mild, and tourism is slowing down. You can see the full month by month breakdown for Iceland travel here. Happy Campers Review • The Best Camper Van in Iceland?